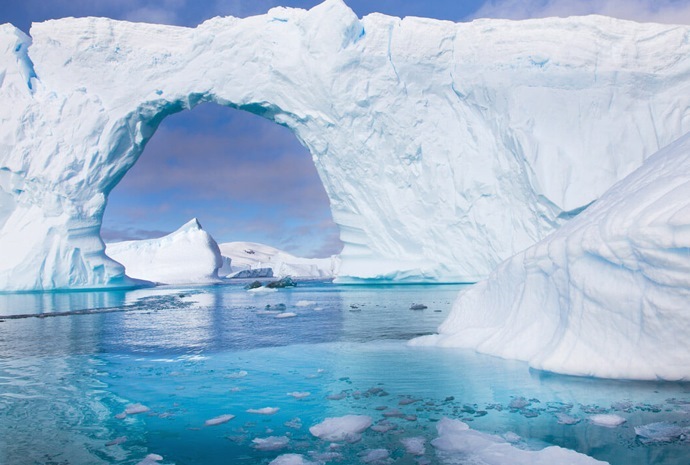 Antarctica is already the subject of hundreds of projects in schools and colleges. The region has a high profile on television and in other media for its wildlife, climate, environment, history and geo-political importance.Above all, it is a fascinating and exciting destination, perfect for study groups of all kinds. 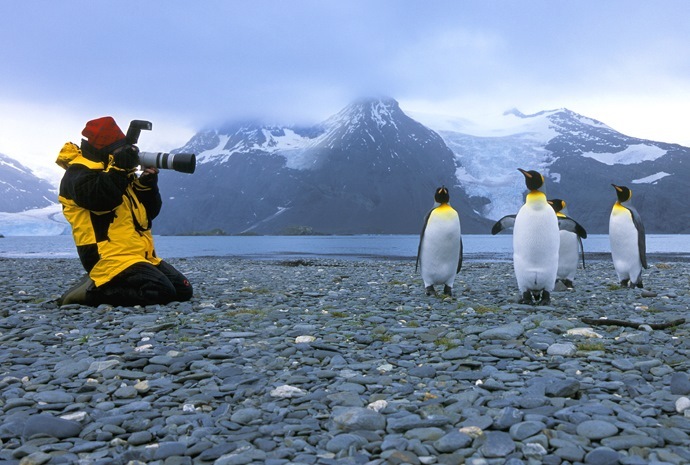 WILDFOOT can tailor-make expedition trips to Antarctica, including South Georgia and the Falkland Islands for groups of students according to their specific requirements or capabilities. WILDFOOT Travel are members of The Travel Trade Association one of the most experienced and professional adventure travel bodies in our industry. 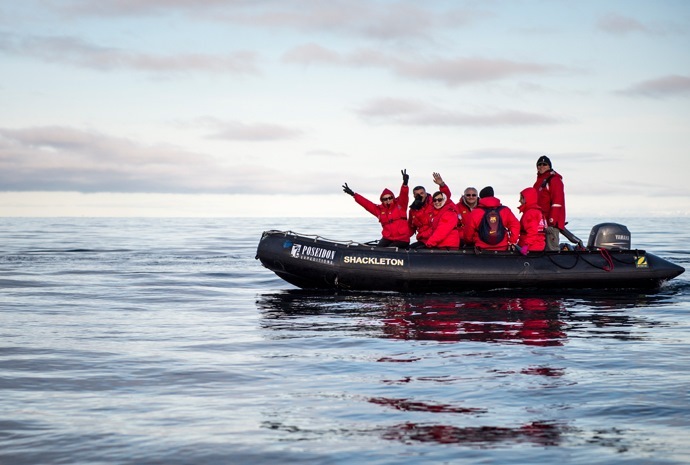 Our team take part in Polar expeditions and activities so we can come back and share them with you directly. We are here to advise and ensure you make the right choices with the finest knowledge available. On some expeditions, there are activity options such as kayaking, shoeshoeing, mountaineering, hiking, cross-country skiing, camping on ice and scuba. Our objective at WILDFOOT is to work hard to match your requirements to the expeditions available. On board ship, all meals and most non-alcoholic beverages are included (cans of carbonated drinks [sodas] are usually charged). Excursions and landings by zodiac. Hotels and transfers as specified in the itinerary. Flights as specified in the itinerary. Flights, if not specified in the itinerary. Optional purchases on board ship, such as beverages, laundry, items of a personal nature, etc. On board ship, each passenger normally has an account for such purchases. This account is the settled at the end of the voyage by cash or credit card. There are few opportunities for shopping ashore on trips to the Polar Regions. Book select cabins by 30th April and receive a 10% discount off the published rates! OR Combine this expedition with a Patagonia trek and receive a 10% discount on both trips, including a land and voyage connection package! Free places: Free place policy varies from ship to ship; however, a free place is normally offered when a group size reaches 19 participants. It may be possible to secure a free or discounted place with lower numbers and WILDFOOT will negotiate this on your behalf if appropriate. Age limit: This varies from ship to ship, but in most cases, participants on an Antarctica school expedition must be 14 years or over. On board: Most ships have an open deck and bridge policy allowing access at most times to all passengers. The overall atmosphere on board is informal and relaxed and passengers enjoy a shared experience. Educational co-operation: There is a team of expert guides and lecturers on board ship. These experts will work closely with group leaders to provide a stimulating environment for students. (Note, this cannot be on an exclusive basis.) Lecture rooms on board can also be made available when not in use. 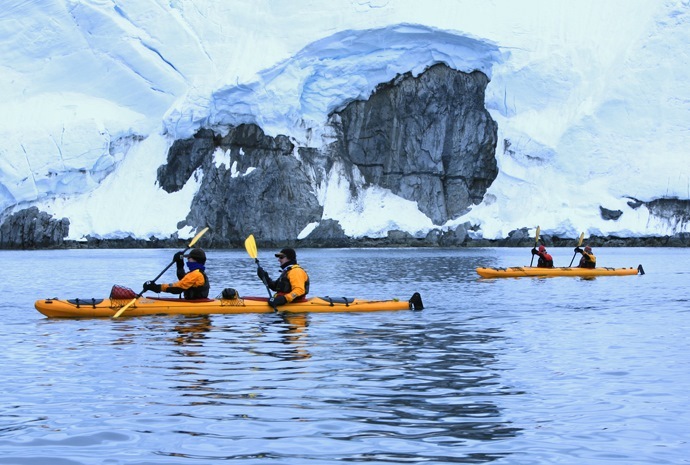 Activities: On some ships, there are optional activities such as kayaking, mountaineering, showshoeing, hiking, camping on ice, scuba, specialist photography, etc. Some of these can be included in the expedition cost whilst others will involve additional charges. For activities such as scuba, evidence of proficiency is also required. Pre-trip: Full Antarctica college expedition briefing notes will be provided for organisers, teachers and/or parents. Superlatives abound – a truly amazing experience...awesome. Thanks to all for making it such a memorable experience. We had the time of our lives on board ship...if anybody wants to go to Antarctica, we will certainly advise to go with you. The best way to describe the entire experience. 1. Top rate service...we would not hesitate to recommend you to others and use you again. Thank you and your team for arranging what was a fantastic holiday in Argentina...Iguazu falls was exceptional with our guide knowing an awful lot about the falls and the wildlife. Could go on forever, but had better stop. I’m sure you get plenty of compliments, but I just wanted to follow up by telling you what a great time we had...If we are planning on one of the other regions you serve, we’ll definitely be in touch! Thanks again for helping me select the best trip and for all your help with the admin and my questions along the way, it all made for an even better experience. Thank you for all your help. Great service, very efficient, flexible...We feel looked after when setting off into the unknown. I feel it is my duty to tell fellow travellers and birders/photographers how good you are! Accommodation: In hotels, accommodation is usually in twin bedded rooms with private facilities. On board ship, cabins are shared on a quad, triple or twin basis. Some have their own shower rooms and others have just a wash basin in the cabin and shower rooms shared with other cabins. Educational content: There are daily lectures on board ship relating to what will be seen during the trip. Subjects include cetaceans and other sea mammals, birdlife, geology and exploration history. Specific field trips ashore are not possible, however, expert guides accompany all landings. Safety: All the ship operators we work with comply with the strictest international safety standards. Ships have ice-strengthened hulls and are all rated for sailing in polar waters. Insurance: All trips are on board expedition ships with a range of passengers on board. It is a condition of the operators of these ships that all participants must submit a medical form signed by a family doctor or other medical professional It is also a condition that comprehensive travel insurance is taken, which includes provision for emergency evacuation. There are a number of insurance companies which provide this cover. Emergency contact: Office hours at WILDFOOT are 09.00-17.30 09.00-17.30 (UK time) Monday to Friday; however, we also have a 24 hour emergency contact number. It is also possible to contact ships in an emergency via satellite communication. Entertainment: There is no entertainment on board most ships, nor televisions in cabins. However, there is a library on board and an open-deck policy with opportunities for wildlife and scenery viewing. 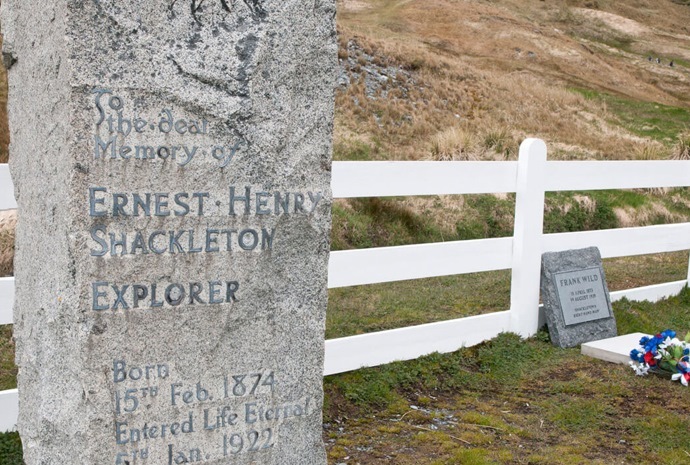 Spending money: Hotels pre and post expedition are on a bed and breakfast basis, so funds are necessary for meals and sundries, including souvenirs. On board ship, each passenger normally has an account for purchases such as beverages and souvenirs. This account is the settled at the end of the voyage. Some ships do take cash for these purchases in a currency of their choice, usually US Dollars or Euros. We will advise which currencies apply. 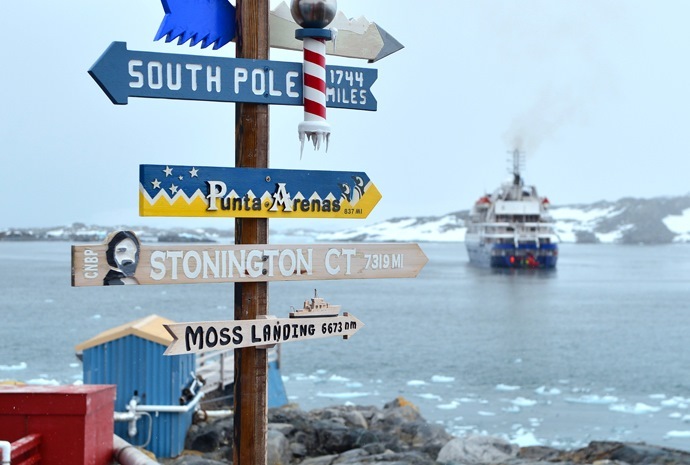 There are few opportunities for shopping ashore on trips to Antarctica, apart from sailings which include the Falklands or South Georgia. Security: WILDFOOT is a fully bonded and accredited tour organiser with a Civil Aviation Authority ATOL certificate and membership of ABTA. 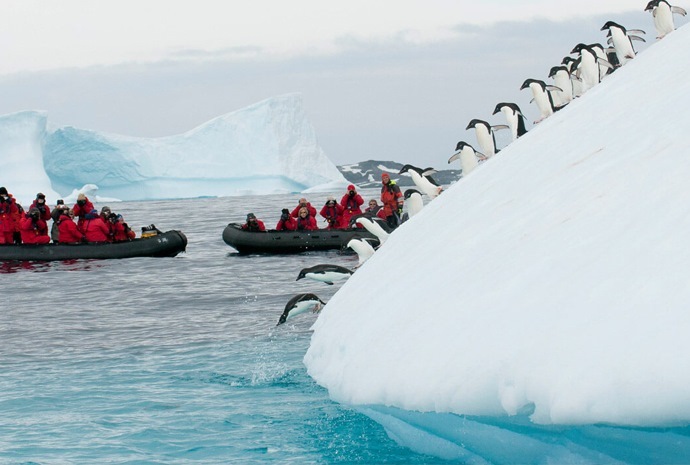 Considering a cruise to Antarctica? Watch our amazing Antarctica cruise video and take a look at what's in store on a cruise in this frozen wonderland. WILDFOOT is a specialist polar operator with ten years' experience of arranging polar expeditions for individuals and specialist groups. Our staff have sailed on a variety of expedition ships and have personal experience of the polar regions, having visited Antarctica, South Georgia, Tristan da Cunha and other South Atlantic islands, Svalbard, Alaska, Northern Norway, Iceland and the Russian Far East, with trips planned to Greenland and Arctic Canada. The company is a member of IAATO (International Association of Antarctica Tour Operators), AECO ( Association of Arctic Expedition Cruise Operators), the Association of Cruise Experts, the Association of British Travel Agents and is a holder of a Civil Aviation Authority ATOL certificate. 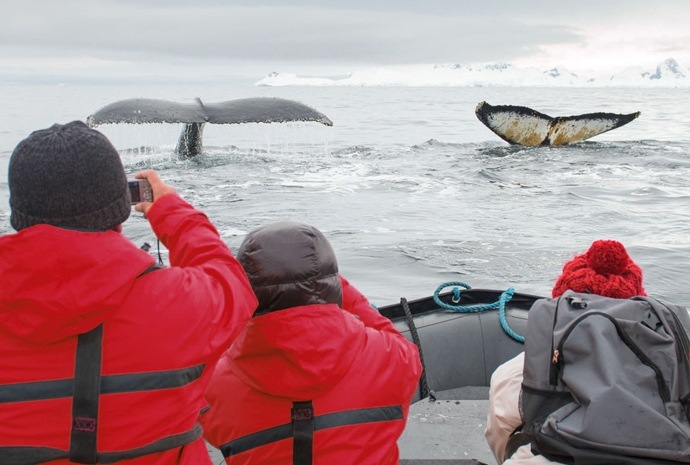 We are committed to responsible travel and protecting the environment of the polar regions. Apart from membership of IAATO & AECO, which promote responsible and minimum-impact tourism in Antarctica and the Arctic, we are associated with the South Georgia Habitat Restoration Project, Save the Albatross, Worldwide Fund for Nature and the Wildfowl & Wetlands Trust. Please enter your email address using the fields below to receive all of the latest news and offers! we are sure we have the perfect trip for you! WILDFOOT are proud to be members of ATTA. The ATTA community put effort towards nurturing, protecting and professionalizing the sustainable development of the adventure travel industry.